Since returning from the ICC World Cup, India captain Mahendra Singh Dhoni has ensured he does not miss even a second from his two-month-old daughter, Ziva. Having missed her birth in February, as he was busy playing in the just-concluded World Cup in Australia and New Zealand, he is keen to make up for lost time. Ziva didn't seem to mind the extra attention as the local media jostled to click her with daddy dearest at the Birsa Munda International Airport in Ranchi, on Tuesday. Dhoni was leaving for Chennai to prepare for Chennai Super Kings' first Indian Premier League match against Delhi Daredevils on Thursday, April 9. He was accompanied by his wife, Sakshi. 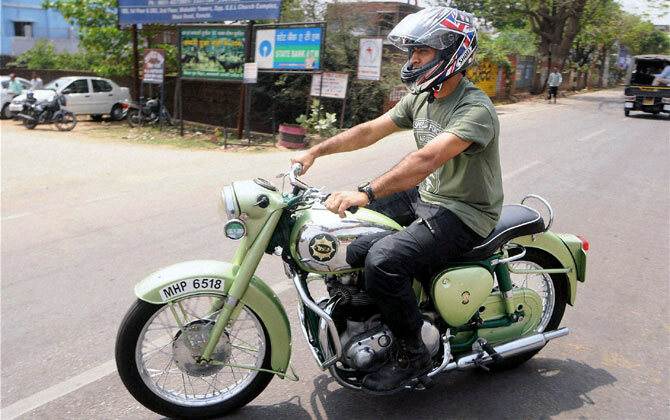 The CSK captain also made most of his time out from cricket, taking his green bullet out for a ride in Ranchi on Monday. Surprisingly, he opted to go all alone, even without security personnel escorting him. Dhoni has a passion for motorcycles, and owns around 20 bikes, including the likes of X132 Hellcat, Harley Davidson, Yamaha 650cc, Kawasaki Ninja, Hero Honda CBZ among others. Dhoni now eyes Superbike World title!